TiVoPony announced today that the promised update to fix the macroblocking issue on the TiVo HD has been released. Owners of the TiVo HD should see their unit update to 8.1.7c2 over the next day or so as they ‘call home’. With the previous two updates fixed some of the issues, this update reportedly fixes the majority of the remaining issues. If you want to get it right away, check your Messages & Settings -> Settings -> Phone & Network screen. If it says â€˜Pending Restartâ€™ then your box has the new software. If not, then â€˜Connect to the TiVo service nowâ€™ and it should download it. Once it says â€˜Pending Restartâ€™ go to Messages & Settings -> Restart or Reset System -> Restart the TiVo HD DVR to force a reboot, and it will install the software. Initial reports are positive. I’d love to see comments from people who have had issues with their TiVo HD as to if this update fixes your problems. And, if not, what you’re still seeing. Its great they fixed this. I had the impression they rushed the TiVo HD out a bit early, but it is looking ready for prime time now. With the US Open Tennis and Football coming up, I hope they fix the bug on the S3 where single FF jumps ahead about 3/4 sec when you hit play. Watched prime time HD content all last night and I didn’t see any of the artifacts like I had been seeing consistently before. I still need to check out the USA channel b/c that is where I noticed it alot, but I’m not too into tennis so I haven’t watched it lately. I noticed it updating yesterday when I got back from work. Since it finished I haven’t noticed any macro-blocking, but I only watched a little TV yesterday since I was finishing off my “Heroes” HD-DVD box set. I’m pleased TiVo fixed this so promptly– As well as keeping us informed every step of the way. I have been watching this site for this news and I was so excited when I saw your post. Yes I think it fixed the problem, I haven’t heard the audio click out or the spots all over the screen. I was very disappointed when I got home with my TIVO HD, no multi room and problems with HD. I guess I should have researched more but I have had a TIVO for 8 years these are standard items. Now just a few weeks later I am very happy they have resolved my issues. I think this has fixed my macroblocking issues…at least, I haven’t noticed any recently (then again, haven’t done much heavy TV watching lately). If this has fixed it all…hooray! One problem I still see (or rather, hear): High pitched squeeks when fast forwarding sometimes. We just got a TiVo HD. I only had about 2 hours before I had to go to work to set it up. I called TiVo to do that Life time from my one Series 1 to it. I was on hold about 45 min. She said they have a lot doing the Lift time from a old TiVo to the new HD one. I did not see what Software Version number had and connected to TiVo and reset it. I seen it was, 8.1.7c2-01-2-652 I put that number in google and came right here. The only link it found. I set up the wish list one of the 1st things. Could of been with the old Software Version. But maybe it came with 8.1. But the actors names all ended with a , after them! I had to edit the , out. All so going to play live TV the next day today it just went to a wight screen. Or playing TV it recorded went to a wight screen till I reset it. The cable person should come out this morning to install 2 cable cards. Looks like it’s working good. I could see how the % numbers on setting up in loading are a lot faster with this TiVo. Seems like a read some place that they will have Video transfer going in November, Next month. 9.2 is the latest software version for the TiVo HD. Go to http://www.tivo.com/priority to sign up to get it sooner. And yes, video transfers are supposed to be enabled in November. Two cable people came out to install the cable cards. He bought like 5 M cards and one not a M card. He never installed this in a TiVo but had on TV’s. It took a long time to set it up. Putting the M card in the TiVo HD after a little bit bought up the cable card menu. In about 3 sec the name on the card slot changed to M card. The problem was listing the channels. It would say none found! But after a little about 10 sec. It went to I think channel 32 from there you could press numbers to test channels. But he was not getting all the channels. It took a long time Rebooting the TiVo, plugging the cable card in and out. He call a person that all ready did installs like this on other peoples TiVo. He was at the Comcast office and he did some reset of the cable card. I think a Internalization of it. Then we could get all the channels. The 1st person he called to give the cable card numbers to did a hard reset of the cable card but that did not help. I think did a soft reset to that did not help. So it was a long time for them to set up the TiVo but it works now. I did not have to much time to look at it because I had to go to work. I tested it out wile they were still here. Recorded 2 HD channels at the same time. Could see 2 red LED’s on the TiVo. It worked. Seems like I read some place a M cable card would not let you record 2 shows at one time. But this worked. I told the cable guy that too. It’s good thing I tested it. Looks like it’s working real good with one M card. When I called the 1-800 number she said they did not have any M cards. But the cable guy talked to some people were he works and found out TiVo HD can take the M card so he brought some with him. 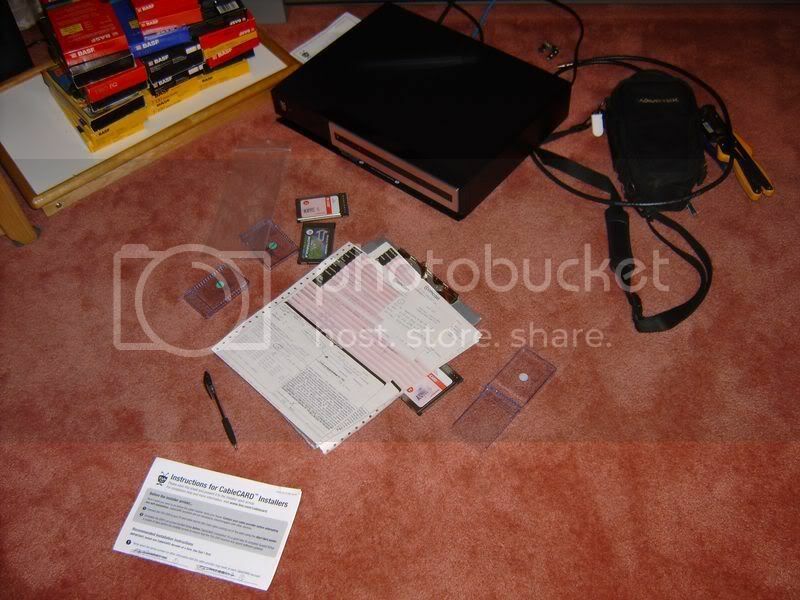 I got a photo of the cable card as he was working on setting it up. 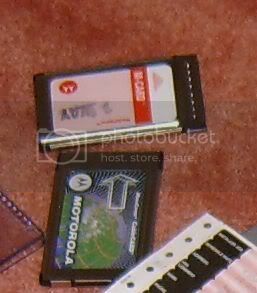 Here is a close up in the same photo of the M cable card. Today in the morning I looked at it more. The names of shows it did find on channels over 99 because now we got a lot more because the cable card. My Mom watches Wheel of Fortune and had that name in the list and now it’s on a HD channel. But it was not coming up. So I went to the guide found it and set up the season pass on it. This Monday will see if it records it. I don’t want to get on a priority list for the 9.2 software. I will just wait for the testing to get out bugs. Is there a link some were talking about the November video transfers? Does it auto record the HD video if it’s on a HD channel? Because Wheel of Fortune is on a HD and none HD. I made sure by going on the HD channel and setting up the recording there. The links did not work. I will try again. Here is a photo I got of when the cable people when out side for a little. Cable person was setting up TiVo HD with cable card. Close up of one of the M cable cards Comcast person brought. Did the links just like the XHTML code says not sure if they will work. Only can tell after doing submit comment. A single M-Card enables both tuners. You need one M-Card or two S-Cards. Video transfers will require the 9.2 software. There have been a few posts on the video transfers – try searching on ‘November’. Season Passes are tied to a specific channel – so if you set the SP on the HD channel it will record HD, if you set it on the SD channel it will record SD. For wishlists, set the category to HD. Yes. I seen that wishlists set up has HD setting on it. If set to that and it can’t find a HD would it record SD? I guess with time the same SD will have a HD show and hope TiVo will know that and will record that and not the SD one. I did not pick HD because right now some of them are not in HD. But would it still record the SD one with HD picked? I only put shows in wishlists becuase it’s nice for TiVo to not record them from were ever they are on any channel. Like Channel 4 use to have Pokemon. Now Cartoon network has it. Stuff like that. If on a Season Passes it would not find it on Cartoon Network. But wishlists are not. It would still find in on the other channel. megazone can you fix the link for me? I don’t get what I do wrong with it. It has to links and only one is working on the words I typed. I did put the link in the 1st “” and thought the text I put in title, the 2nd “”, would be what you click on in the link. But it don’t work right. I put a space befor and after the so it will not use it as a tag. I hope. To do a link it is <a href=”URL” title=”TITLE”>LINK TEXT</a> where URL is the URL you want the link to go to, TITLE is text that shows when the cursor hovers over the link (and title is optional) and LINK TEXT is the text you see as the link in the post. If you set a WL for HD then it only records HD, not SD, You can set to WLs – one HD only, one not, and put the HD only one as a higher priority. That is just how I did the link but it does not work right. Megazone you fixed it and think you for doing that. I don’t know why the links don’t work for me when I put them in just how you said. Hope TiVo does a update so your can do a thumbs up if you want it to record HD more then SD shows but if it can’t find a HD one it will do the SD one. Maybe you can fix that. If you take a flash light to the frunt of the TiVo HD you can see a display mode that says 1080p all the way to the right! I guess nothing on cable or over the air is 1080p right now right? TiVo is looking ahead for when/if they will do 1080p. Raymond, you’re getting better with the links – but the link you did above you entered as: <a href=”â€www.tivo.com/expandâ€” title=”â€placeholderâ€”> http://www.tivo.com/expand</a&gt; You’ve got an extra set of quotes around the href and title value. Actually, it looks like you might’ve entered ‘smartquotes’ and the blog software ‘fixed’ that by wrapping the value in normal quotes. To me the inner and outer quotes don’t look the same, so that might be it. No problem – always good to learn new things. And yes, the HD has a 1080p indicator on the front. The highest quality for broadcast TV or cable is 1080i, so I suspect that could be for future HD downloads over broadband or the possibility of future enhancements to broadcast or cable. ATSC technically can do 1080p, but only by dropping the framerate. We have a Sony TV that can do 1080p wide screen. I guess only HD DVD’s can do 1080p or game systems. This TV has a PC input too. I hooked a lap top to test on it but it’s video can’t do 1920 by 1024. I have to drag a big PC in the living room just to see what something like 1080p would look like. But sending HD they have 3 videos like 100-1 100-2 100-3 would they have to drop one or both to have just on 1080p? It sounds like you’re asking about digital sub-channels. There are many variables involved, but as a rule of thumb 1080p would require twice the bandwidth of 1080i content. They have a update that lets transfer from the TiVo HD. But every one I test it keep saying. “This recording started transferring but has been interrupted. TiVo Desktop will keep trying to transfer the recording.” I will leave it running all night. Right now the TiVo is not recording any thing just in stand by mode. I even went to https://192.168.2.14/nowplaying/index.html?Recurse=Yes and clicked download but it just shows the world icon with paper going to a folder and 0%. Has any one download a video off there TiVo HD? Looks like it had to reset. Today in the morning had a message on the TiVo that got the update 9. something. I did not even get on there list. But now the transferring works. I thought the 9. was still in testing. This is neat besides are HD TV and Now TiVo can watch some shows on other TiVo’s that they others can’t get with 2 to 99 channels. We have no cable box’s. One thing I came up on now. Want to record show’s they have on at 9 pm for 2 hours. It’s the hallmark channel. Looks like every night. But it’s not the same name. Some different show all the time. Do I have to do manually record something like that? If I do season pass on it, it just does one show. 1080p indicator for TiVo HD! Do you think its 24p or 60p potentially? Is there an actual ATSC format for 1080p, or is it just feasible to create a new one with a frame rate less then 60? Raymond – 9.1 was released a few weeks ago, and now 9.2 is in the process of being released to all S3 & HD boxes. As for the recording – you can only do a Season Pass if it is considered a series in the guide data. If it is a kind of ‘movie of the night’ thing there they just show a movie each night 9 to 11, chances are it isn’t in the guide as a series. If it has some recurring keyword “Hallmark Movie Tonight” or something, you could use a Wishlist. Otherwise your best best is a ‘Manual Season Pass’ aka a manually scheduled recurring recording. Tell it to record by time and channel each night – there are options like every night, just week nights (mon-fri), etc. If ATSC were updated to use MPEG4 instead of MPEG2, then 1080p60 would be quite possible within the bandwidth constraints for broadcast. But then nearly all ATSC receivers in homes today would be unable to tune those channels. Only a few, like TiVo, include MPEG4 support. I am always out of the house, and always miss my shows, I am glad that they got this fixed because I was going to just get the standard TiVo. I get home and watch all of my shows, and dont really care about the HD, but im getting it for free, so I want to take advantage of it. I got it free from http://www.aeidish.com.